Come wade in the water with the mythical lake monster, “Nessie” the Loch Ness Monster. The last known sighting of this plesiosaurs-like creature was in Scotland in 1933, but now again, we’re shaping it. We’ll meet this Thursday at 7pm at WildCraft Cider Works (232 Lincoln). This ride is gonna be huuuuge. (Actually, that’s an overstatement–it is quite small.) Let’s dilly dally around this miniature hand starting from Cornucopia (Lincoln St) at 7pm on Wednesday, March 27th. Cure this week’s debate aftertaste with a dose of Bike in Shapes. This Thursday, we’ll ride the Presidential Comb, tracing the comb’s teeth from President Taylor to President Lincoln’s streets. We’ll meet at the Falling Sky Pour House & Delicatessen on Blair and head over the comb over! Happy summer’s peak! Clip in and join us ride the Mt. Hood Tour de Shapes on Saturday, August 13th out to Agrarian Ales in Coburg. We’ll start from Arriving by Bike (on Willamette) at 10:30 and head out to Coburg. Now does that peak your interest?! On belay? Set your axles and pull the reins, it’s May is Bike Month and time for Bike in Shapes’ Oregon Trail ride. 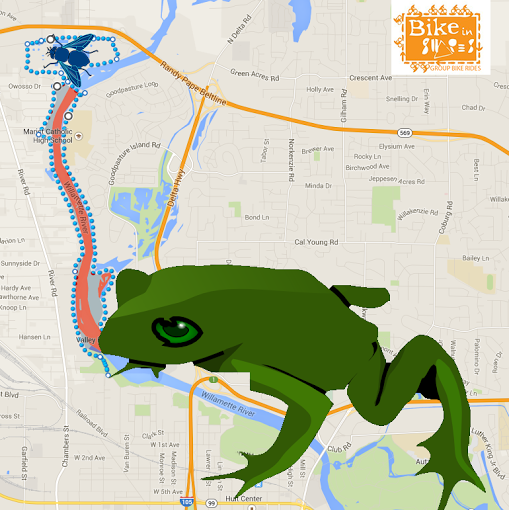 We’ll meet on top the Autzen Footbridge at 7pm on Thursday, May 12th and pioneer over through Springfield to the Claim 52 Abbey at Sprout regional food hub (418 A Street). Thanks to the wonderful folks at the Abbey for hosting us. There are so many other wonderful bike events and commute challenges this month–so have fun and rock your helmet hair. Get out your unicycle (or bicycle) because it’s time to ride the uni-brow of uni-brows. That’s right, let’s trace Ernie’s best friend’s eye brow. We’ll meet this Monday, January 25th at The Cannery at 7pm. As you can see, Burt means business–be there or be rectangle. Spring is here and the river calls. We’re beginning our countdown to Bike in Shapes’ 5th birthday in June. It seems like the perfect time to dig up, the shape that started it all: the OG, the Frog’s Tongue and Fly. That’s right, the origins of Bike in Shapes can be traced to a ride following a “tongue” that flows along the Willamette only to meet an industrial plant of a “fly” past the Knickerbocker Bridge.This bizarre whim set in motion these past five years of pomp and absurdity. So, let’s dust off the Tongue, and meet at Sam Bond’s Garage this Thursday at 7pm, ride the river, and return in ample time for their 90’s night. Come this Thursday and be prepared to vote your favorite all-time shape as a finalist for the June 17th Anniversary ride.